July 3, 2017 – Two NASA satellites provided a look at the Northwestern Pacific Ocean’s latest tropical storm from outside and inside. NASA-NOAA’s Suomi NPP satellite provided an outside look at Nanmadol when it’s maximum sustained winds peaked, and the GPM Core satellite provided an inside look at the rainfall within the storm. Before consolidating into the fifth depression of the Northwestern Pacific Ocean’s hurricane season, Nanmadol was a low pressure system designated System 99W. That low pressure area developed and was renamed Nanmadol on July 2. The name comes from an archaeological site adjacent to the eastern shore of the island of Pohnpei, one of the four states in the Federated States of Micronesia. The word means “spaces between” and is a reference to the canals that run through the ruins. The GPM or Global Precipitation Measurement Mission core observatory satellite flew above tropical storm Nanmadol on July 2, 2017 at 2306 UTC (7:36 p.m EDT). The intensifying tropical storm was located just northeast of Taiwan and had maximum winds estimated at 45 knots (51.8 mph). The GPM Core Observatory carries the first space-borne Ku/Ka-band Dual-frequency Precipitation Radar (DPR) and a multi-channel GPM Microwave Imager (GMI). Rainfall within Nanamadol was derived from data collected by GPM’s GMI and DPR instruments. Those data indicated that rain was falling at a rate of greater that 184 mm (7.2 inches) per in powerful storms northeast of the storm. At NASA’s Goddard Space Flight Center in Greenbelt, Maryland GPM’s Radar (DPR Ku band) enabled a 3-D examination of tropical storm Nanmadol’s precipitation anatomy. Those data showed that an eye like structure was present at the intensifying tropical storm’s center of circulation. DPR found that storm top heights near the center of circulation were reaching altitudes of over 14.4 km (8.9 miles). The tallest storms were seen by GPM in a large feeder band to the southeast of the storm’s center where storm top heights were reaching altitudes of over 16.4 km (10.2 miles). 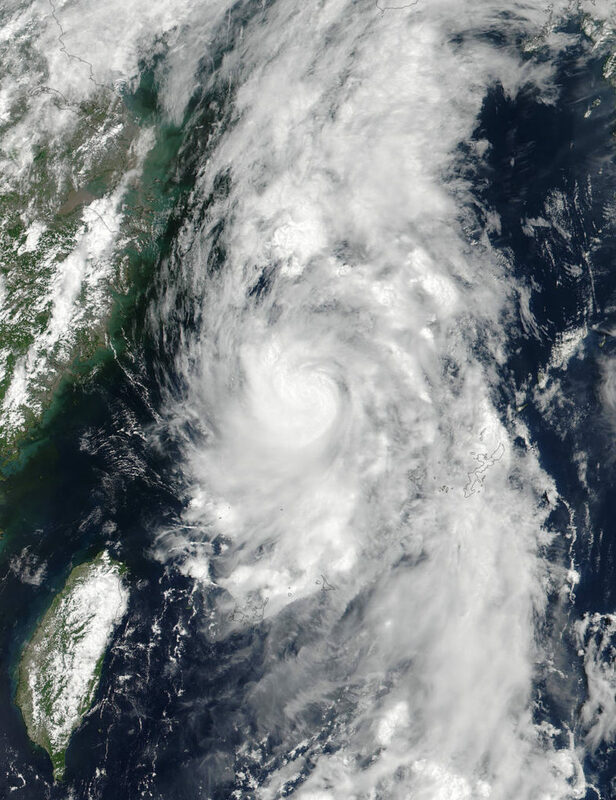 At 05:12 UTC (1:12 a.m. EDT) on July 3, the Visible Infrared Imaging Radiometer Suite (VIIRS) instrument aboard NASA-NOAA’s Suomi NPP satellite provided a visible-light image of Tropical Storm Nanmadol. The VIIRS imagery showed a tightly wound tropical storm, with bands of thunderstorms wrapping into the low level center from the northwest and southeast. Infrared imagery showed that Nanmadol had briefly developed a pinhole eye. At 1500 UTC (10 a.m. EDT) on July 3, Nanmadol’s winds had peaked at 60 knots (69 mph/111 kph). Tropical-storm-force winds extended out to 60 nautical miles (69 miles/111 km) from the center making the small storm about 120 nautical miles (138 miles/222 km) in diameter. It was located near 30.3 degrees north latitude and 127.1 degrees east longitude, about 284 nautical miles (327 miles/526 km) southwest of Sasebo, Japan. Nanmadol was moving to the north-northeast at 20 knots (23 mph/37 kph). The JTWC noted that Nanmadol is expected to weaken as it approaches the western coast of Kyushu, Japan and tracks over cooler sea surface temperatures. The sea surface temperatures are cooler than the 26.6 degrees Celsius or 80 degrees Fahrenheit needed to maintain a tropical cyclone. By July 4 at 0200 UTC (July 3 at 10 p.m. EDT), Nanmadol is expected to weaken further as it begins to interact with the rough terrain of Kyushu. The storm is then expected to move east-northeast across Kyushu, Shikoku and Honshu while becoming extra-tropical.